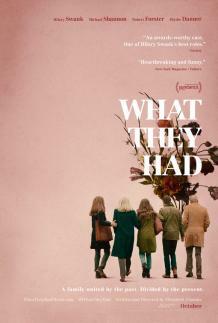 "At first glance, you might mistake What They Had for one of those well-meaning family dramas about what to do when your mom is diagnosed with Alzheimer’s. But that would discount the exceptional accomplishment achieved by debuting director Elizabeth Chomko, enlivening her scrappy script with a cast of actors who truly are as good as it gets. You laugh as much as you cry, which means you believe in the movie’s truth. "The ever-glorious Blythe Danner excels as Ruth, a senior-care nurse who starts showing signs of dementia. She leaves her apartment on a snowy Chicago morning, wearing just a nightgown and gets on a train heading for the long-gone home of her childhood. Her husband Bert (Robert Forster) turns a blind eye, bristling like the military man he was when his son, Nicky (Michael Shannon), says it’s time to get Mom institutionalized. Dad’s heartache is palpable. Enter daughter Bridget (Hilary Swank), in from Los Angeles with her own daughter, Emma (Taissa Farmiga), still smarting over getting kicked out of her college dorm for being drunk and disorderly. Bridget gets to cast the deciding vote on what to do with mom since she has power of attorney for both her parents. "The subject of memory loss has been tackled before in such acclaimed films as Still Alice and Away From Her. But Chomko, an actor and playwright, is drawing from the lives of her own grandparents. And she doesn’t tread delicately.